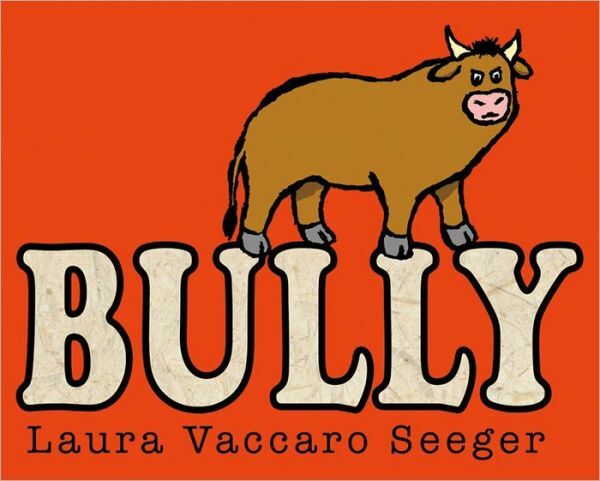 Yesterday I read Bully by Laura Vaccaro Seeger and just knew I had to share this book with my students. First thing this Monday morning we gathered together for a read aloud. What a powerful experience. As always, I love that Seeger can say much with so few words. This story is conveyed through simple illustrations weighty with emotional expressions and speech bubbles that send big messages. I read the story and said almost nothing else. Seeger’s story truly speaks for itself in a room full of children comfortable sharing their ideas and observations. There was a mean bull and another bull passed by the mean bull who said GO AWAY! Then that bull was mad and then rabbit came and asked, can I play with you and the bull said NO! The bull bullied every single animal. But the goat said “Bully” and the bull started to cry and he said sorry. Because I always believe that students say it best, some more student responses . . .
Heman: I think the goat in the story is brave. Why did the Bull bully the chicken? At the end of the story it was nice and calm again. It was nice when the Bull made friends with the Turtle, Chicken and Rabbit. Kelvin: I felt sad when Ms. Gelson read it. I give it a 5/5. It’s in my ten favourite books list. I wish that the bully felt sad for the bull at the start. I love when the bull came from a devil to like a god. I felt happy for the bull when he went from mean to nice. His heart was brave. He turned his heart upside down. Soleen: When he bullies, he gets smaller but he feels bigger. The goat was brave enough to tell the Bull you are a bully! Ibtihal: So every time when he says a mean word, he feels like growing bigger. Then he said “I am sorry Do you wanna play?” So they (the animals) said a nice word “yes” you can play with us. Gracie: First, the Bull was bullied. And then he was a bully. When he was the bully he was getting smaller but he feels like he’s getting bigger. Maybe the bully who was bullying him got bullied? The goat was very brave. The goat changed the bull. The chicken, the turtle, the rabbit and the goat all got bullied. But they said yes to playing with the bull. Powerful for young children and even for listeners right into middle school this is a jumping off point for many conversations and reflections. Highly recommended. This entry was posted in Classroom Views, Picture Book Love and tagged bully bullied bystander, favourite illustrators, great read alouds, Laura Vaccaro Seeger, picture books, social responsibility books by carriegelson. Bookmark the permalink.